This is one of the most important and appreciated events in Venice, and it takes place every year along the Grand Canal. 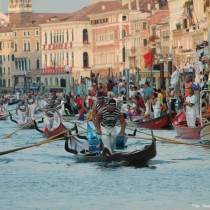 Dozens of Venetian rowing boats re-enact the procession organised for the arrival in Venice of Caterina Cornaro, queen of Cyprus, in 1489. The re-enactment is then followed by a competitive regatta, which is one of the main rowing events of the season.